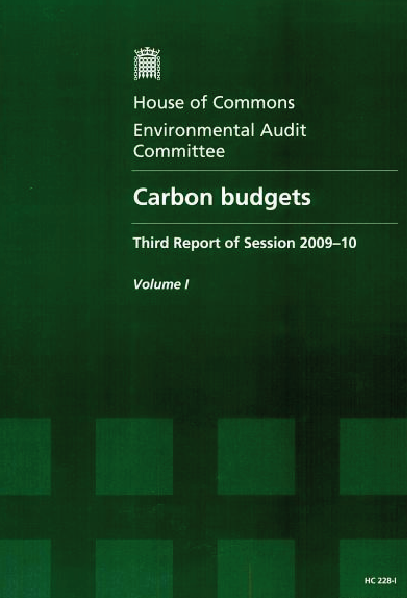 The UK Climate Act (Contraction and Convergence) 2006 was introduced by Colin Challen MP in 2006. It was based on the key reccommendations of the Royal Commission on Environmental Pollution 2000.
founded and chaired in 2006. Aubrey Meyer has said. We didn't call it that - it became emotive for reasons I don't really understand." the rate of convergence needs to be accelerated relative to that. "Let us recognize that a global deal has to be fully inclusive, demonstrate how we calculate burden-sharing and be equitable as no-one will accept a deal that builds in their disadvantage. That framework is Contraction and Convergence." 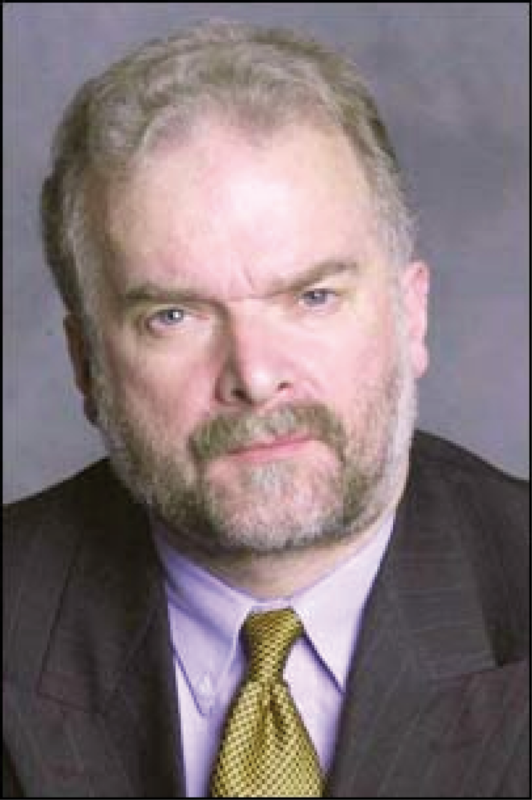 The Incontestable Truth - Colin Challen speaks on C&C on behalf of his APPGCC colleagues . This DVD was produced on behalf of the UK House of Commons All Party Parliamentary Climate Change Group of MPs (APPCCG) by GCI and Tangent Films. It was distributed to all sitting UK MPs in 2007. It points to the disciplined approach we need to address climate change. Not an approach based on wishful thinking, but a rational framework which leads to the solution foreshadowed in the original 1990 United Nations Framework Convention on Climate Change (UNFCCC), and subsequently much ignored. Q118 Mr Challen: You said in your January article that you were setting up a team to look at how the UK could mitigate its carbon emissions. I wonder if you could give us a progress report on that. In particular, whether you have had a chance to look at the cost to the UK of doing so, and whether indeed in its remit you might be asking it to look at the principle of contraction and convergence to see if that is a workable proposal? Professor Sir David King: Can I take the second question first? Contraction and convergence has definite attractions, but there, again, we are talking on a global scale and we are talking about an alternative to the Kyoto process with carbon emission trading. Contraction and convergence is a permit system where you can exchange permits between countries. In essence it is a trading system but it does look at developing countries, so they can be brought on board by allowing them to build up their CO2 emissions while developed countries reduce, but they should peak at a certain level. I can see the attraction in the whole process, but I have to emphasise that the only game signed up to internationally is Kyoto, and until we have those absent from the signatories coming forward and saying "We would rather discuss contraction and convergence", I think we have to work within the Kyoto agreement. That is the process that we are set on. Q119 Chairman: If Kyoto does not make progress because of the reluctance of some countries (and we know who they are and where they live) to participate, contraction and convergence must be a viable alternative. Professor Sir David King: I think it is a very interesting alternative, but as I say I think the key thing is that if those countries that are not satisfied that Kyoto is the way forward come to us at the negotiating table, I am happy for us to negotiate on that, and I believe our government is—as long as it is not seen to be a delaying tactic, because I think this is a matter of some urgency. Any framework which involves radical emission reductions would in practice resemble the Contraction and Convergence approach advocated by the Global Commons Institute. Indeed, in terms of domestic policy aims, the UK Government has already implicitly accepted this approach in adopting the 60% carbon reduction target for 2050; and it is therefore inconsistent not to adopt such an approach internationally. We do not see any credible alternative and none was suggested in evidence to our inquiry. We therefore recommend that the UK Government should formally adopt and promote Contraction and Convergence as the basis for future inter-national agreements to reduce emissions. We would urge the Government not to see its role during 2005 as being simply to broker international discussion. It should rather provide leadership by promoting specific objectives and targets. 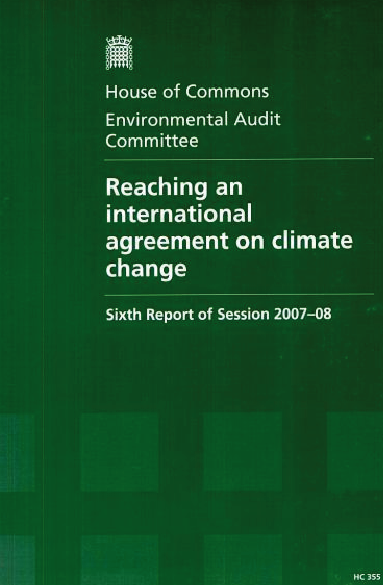 In that light we would make the following recommendations: (Paragraph 101) The UK Government should commit itself to Contraction and Convergence as the framework within which future inter-national agreements to tackle climate change are negotiated; and it should actively seek to engage support for this position during 2005 in advance of the next Conference of the Parties. Within the UNFCCC negotiating framework, the UK should press for a review of the adequacy of the commitments in the Convention, and focus its efforts on the need to agree more challenging absolute emission reduction targets within a post-2012 agreement. 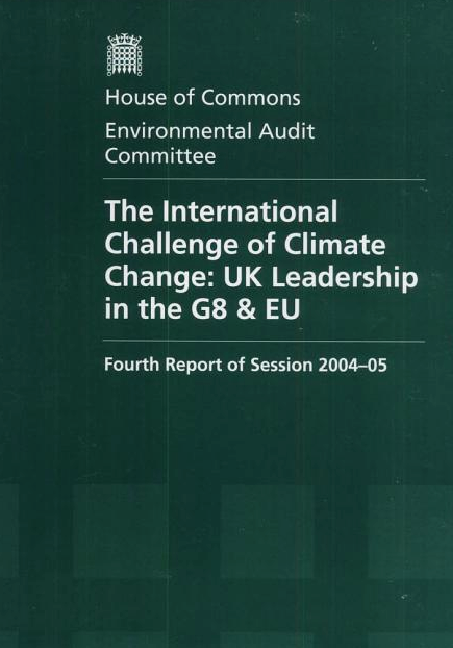 UK Leadership in the G8 & EU [contains extensive evidence, both written and spoken, from GCI to EAC]. "The earlier section on “A Consensus on Targets Plus Means?” outlines some of the points on which consensus would be desirable and on which it might be reached, ranging from targets through a broad policy framework to specific policy measures. In this section we list some of the areas in which measures might be agreed upon. We address two measures - Domestic Tradable Quotas (DTQs) and Contraction and Convergence (C&C) – in more detail, because they featured heavily in a number of submissions. 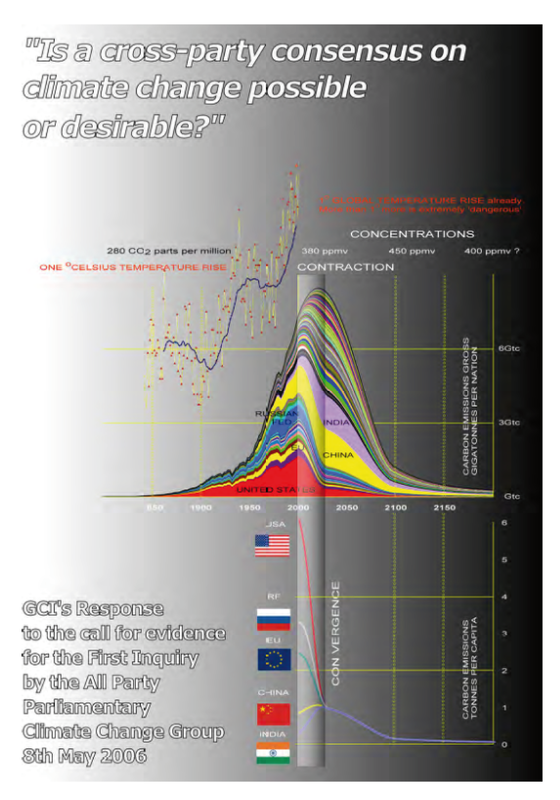 Both DTQs and C&C would be consistent with the acknowledgement that there is probably a maximum“safe” atmospheric carbon dioxide concentration, and that staying below it necessitates a post-Kyoto concentrations-based international framework agreement for stabilising greenhouse gas concentrations. The trading of emissions rights under this agreement (a cap-and-trade system) could be based on the C&C and DTQ (or other global and domestic carbon rationing) proposals.It is not our role to judge the merits of C&C. However, we recommend that the proposed climate policy group and the independent body (Recommendation 12) consider whether cross-party support should be given (a) to C&C as an approach to setting international emissions targets, and/or (b) to some form of national carbon-rationing system, such as DTQs, alongside other means, as an instrument for achieving the targets that a C&C cap would impose on the UK. Consideration of these issues may require further detailed research." Is a Cross-Party Consensus on Climate Change Possible – Or Desirable? 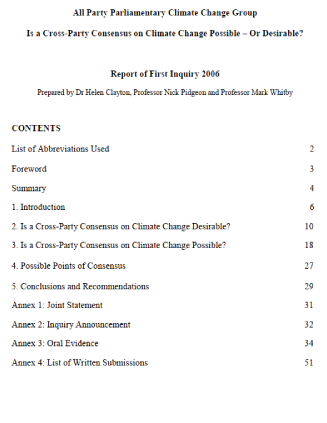 “Is a cross-party consensus on climate change possible, or desirable?”. Under C&C some developing countries, such as India and Indonesia, might only be permitted to increase emissions intensities for a very limited period, after which time they would be required to reduce them. Other developing countries like Thailand and Venezuela, which have relatively high per capita emissions, would be required to reduce emissions immediately. However, it has been argued that that C&C could provide an equitable framework for a ‘genuine long-term solution to climate change, reducing political risk and offering businesses and investors the sort of predictable framework they prefer’. 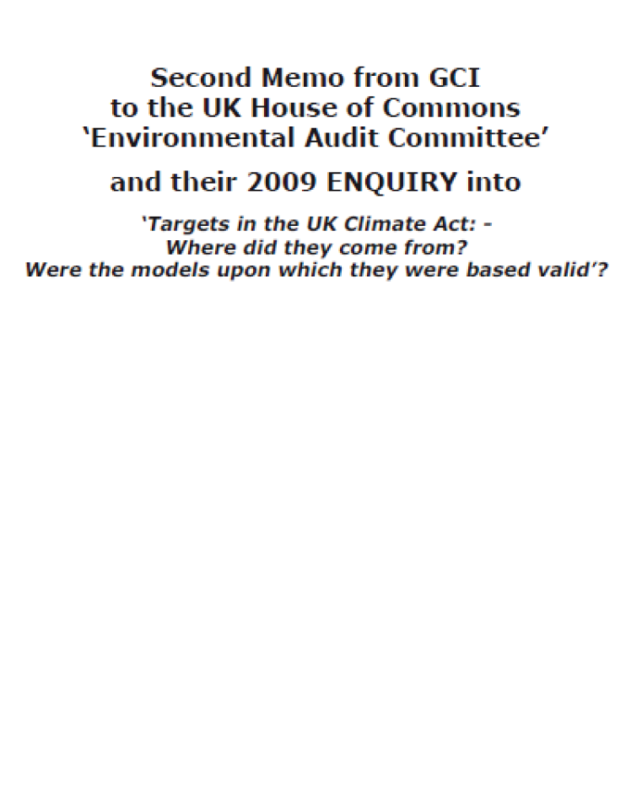 "'Targets in the UK Climate-Act: Where did they come from; were the models on which it is based valid?" showed they came from C&C and successfully challenged HMG on the 'odds' of their targets keeping within '2 degrees' global temperature rise. The Global Commons Institute said that the origins of the advice from the Committee on Climate Change could be traced back to the Royal Commission on Environmental Pollution’s advocacy of contraction & convergence in their report ‘Energy—the Changing Climate’ published in 2000.52 The Global Commons Institute promotes contraction and convergence as a means of resolving the impasse in international negotiations. Contraction and convergence is a framework for reducing global emissions of greenhouse gases that envisages global emissions peaking and then gradually falling (contraction). It achieves the reduction in emissions by limiting per capita emissions in such a way that they converge (convergence). It entails large cuts in per capita emissions for developed countries while allowing developing countries to continue growing their economies before they have to make cuts to reach equal per capita emissions. Lord Turner said that the advice of the Committee on Climate Change was, “reasonably pragmatically close to Contraction and Convergence”. Question: - Where did the UK budgets come from? Are they adequate to keep within the 2 degree limit? 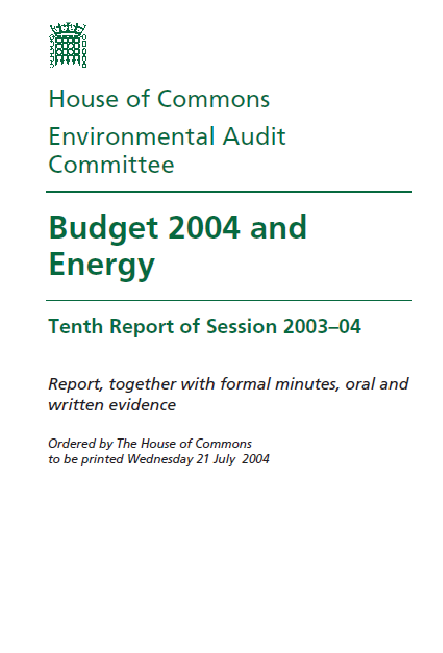 The UK budgets came from Contraction and Convergence via the Royal Commission on Environmental Pollution [RCEP] 2000 report “Energy—The Changing Climate”. The report recommended C&C but applied it at rates that are too slow to keep within the 2 degree limit. 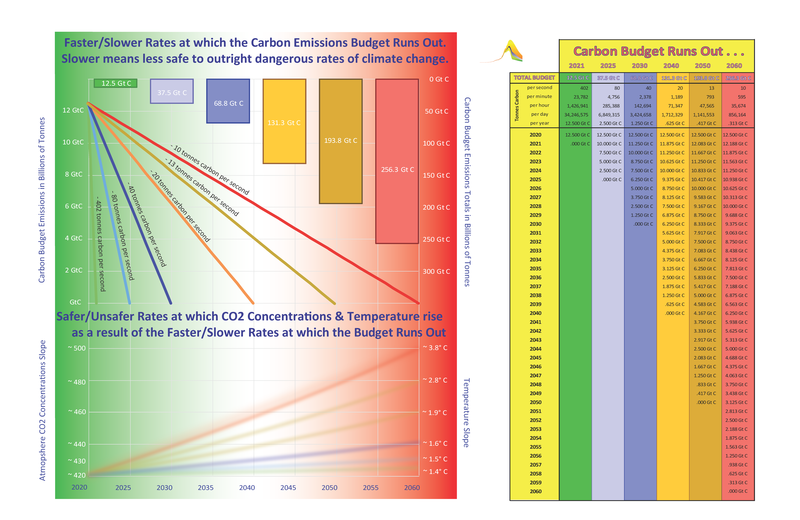 To keep within the 2 degrees Celsius temperature limit, the budgets need to be based on a global emissions contraction of 80% by 2050 and where the airborne fraction may still stay constant @ 50% giving a 450 ppmv outcome. But with sinks failing @ 0.5%/yr, the outcome only may still be 450ppmv. 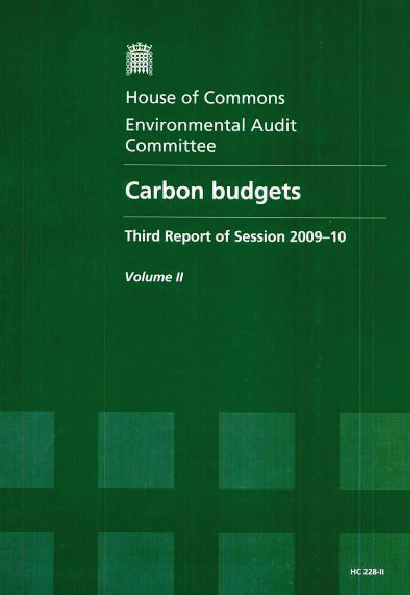 By not taking account of the “new” Coupled-Carbon-Cycle modelling in IPCC AR4 Chapter 10 , the UK Climate Change Committee models and the assumptions used by the Committee on Climate Change are not valid in setting carbon budgets. There is unanimous agreement among the coupled climate carbon cycle models driven by emission scenarios run so far that future climate change would reduce the efficiency of the Earth system (land and ocean) to absorb anthropogenic CO2. There is evidence that the CO2 airborne fraction is increasing, so accelerating the rate of climate change. Until about 1800 the overall climate system was at equilibrium. The very sudden rise of the atmospheric concentration of CO2 and CH4 since then shows that the system is no longer in conditions of homeorhesis, it is going out of control. The basis on which the UK Committee on Climate Change arrived at the UK’s share of the global effort to cut emissions was the RCEP and their advocacy of Contraction and Convergence. There appears to be an emerging consensus for Contraction and Convergence as the UNFCCC-compliant global framework for climate mitigation, as evidenced in the reference material attached to this memorandum. 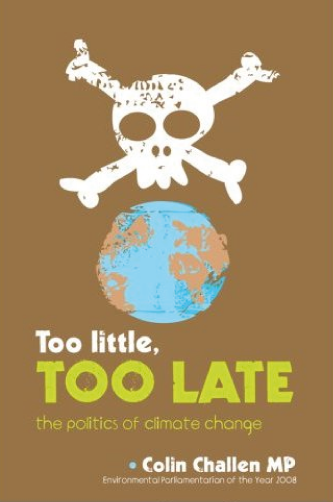 There is real danger of not doing enough soon enough to avoid dangerous rates of climate change. But with sinks failing @ 0.5%/yr, the outcome only may still be 450ppmv. 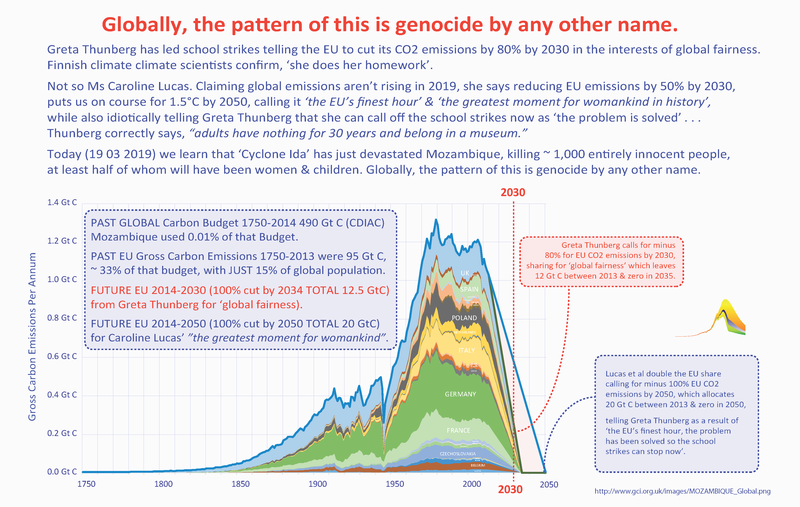 In concert with others, the UK Government’s aim is to limit overal global temperature above pre-industrial to no more than two degrees Celsius. Not exceeding 450 ppmv CO2 in the atmosphere is considered a pre-requisite of keeping within that limit. “Enforcing” the right target will be no harder than enforcing the wrong target. "....notes that terrorism is more likely to flourish in conditions of social injustice and environmental degradation; further notes the significant disparities in energy consumption and greenhouse gas emissions between developed and developing countries; further welcomes Recommendation 3 of the RCEP's 22nd Report that 'The Government should press for a further global climate agreement based on the Contraction and Convergence approach, combined with the international trading in emission permits." That this House welcomes the Archbishop of Canterbury's call for the Government to take the lead internationally in pressing for contraction and convergence of greenhouse gas emissions as the underlying principle of its policy on the Kyoto Protocol during the Prime Minister's chairmanship of the G8 and presidency of the European Union in 2005. That this House recognises the serious threat posed to all life on this planet by climate change as a result of increasing greenhouse gas emissions; notes with grave concern the continued failure of the United States federal administration in particular to join international efforts to cut these emissions levels; further notes the extreme differences in emissions levels per head between nations; recognises that the objections of non-signatories to the Kyoto Treaty that it does not include rapidly developing nations such as India and China requires the need for a new global policy to tackle climate change beyond Kyoto; therefore advocates a policy of contraction and convergence, in which all nations seek to reduce their levels of greenhouse gas emissions, and converge emissions levels towards a point where all citizens of the world are entitled to emit equal amounts of pollutants recalls the Prime Minister's promise to make tackling climate change a priority for the United Kingdom's presidencies of the EU and G8 this year; and urges the Government to adopt this policy and use this opportunity to urge other national governments to do likewise. That this House welcomes the recent decision of the Synod of the Church of England to support contraction and convergence as the overarching framework to tackle climate change; further welcomes the comments of the Honourable Kalonzo Musyoka, Minister for Environment and Natural Resources, Kenya, given at a meeting for African Environment Ministers in Nairobi in February, supporting contraction and convergence; congratulates Aubrey Meyer, founder of the Global Commons Institute, which formulated the concept of contraction and convergence, on receiving the Climate Change Champion Award made by the Corporation of London, for his work in attracting the support of many government and international agencies for contraction and convergence; and calls upon the Government to seek, during its presidency of the G8, to advance the international effort to avert the dangers of climate change by promoting the constitutional framework of contraction and convergence, which embodies the principle of equal rights to the global commons. That this House welcomes the presentation of the Climate Change (Contraction and Convergence) Bill, which seeks to establish a clear, full-time framework for tackling climate change; notes that humankind has no choice but to reduce greenhouse gas emissions to a sustainable level within a defined period; further notes that it is unlikely that any international framework will succeed if it is not based on the principle of equity through the equal distribution of emissions rights, and that any solution put forward which does not solve the problem of climate change faster than the problem is created is no solution at all; and calls upon members of parliaments around the world to put forward similar bills in their own legislatures. "To forestall further damage, deeper cuts in greenhouse gas emissions than as presently contained in the Kyoto Protocol are urgently required and these must be organised as universal and equal entitlements as engraved in the principle of the Contraction & Convergence Framework". That this House congratulates the Prime Minister on his speech at King's College, London on 26th June, in which he called for an acceleration in discussions leading to a new framework to tackle climate change; notes that both he and the Secretary of State for Environment, Food and Rural Affairs have praised the contraction and convergence proposal; and urges the Government to ensure that this model features highly in future negotiations. 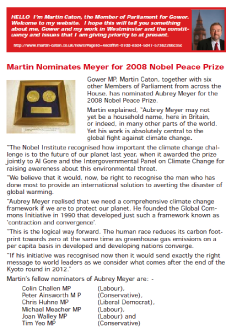 Martin’s fellow nominators were Colin Challen MP (Labour), Peter Ainsworth MP (Conservative), Chris Huhne MP (Liberal Democrat), Michael Meacher MP (Labour), Joan Walley MP (Labour) and Tim Yeo MP (Conservative).